Posted 1911-12, with Downey head half pence stamp. Taken 1961.The magnificent edifice of Leawood Pumping Station has changed little since it was built in 1849. The engine itself was built by Graham & Company at the Milton Iron Works, Elsecar. Today it is fully restored, maintained by a dedicated team of workers, and is in steam and open to the public on several weekends each summer when it is well worth a visit. Credit C M & J M Bentley. 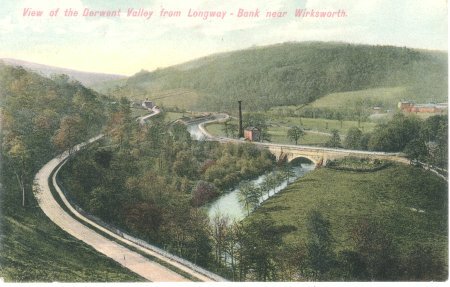 The view from Longway Bank, above Derby Road (now the A6), showing the river Derwent with the Wigwell aqueduct (built around 1792 by Jessop) taking the Cromford Canal over the river. Leawood Pump House is behind and to the left of the aqueduct, behind the Pump House is the railway, and in the left distance the Wharf shed and railway workshops. The railway disappears into Leawood tunnel behind the trees. In the right distance are Smedley's Mills at Lea Bridge. 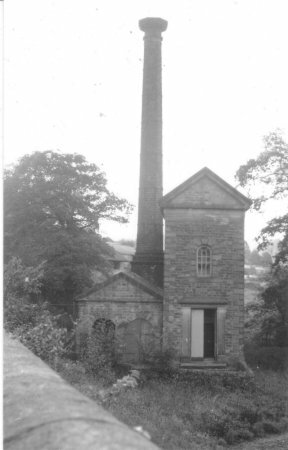 The Pump was built in 1849 to raise water from the Derwent into the canal, after supplies from Cromford Sough ceased, following the opening of Meerbrook Sough. This drained not only the deeper lead mines but also the water from the earlier Sough. Today there is a lovely walk from the Wharf along canal to the Pump House and over the aqueduct. The area is a fascinating concentration of 18th and 19th century Industrial history. 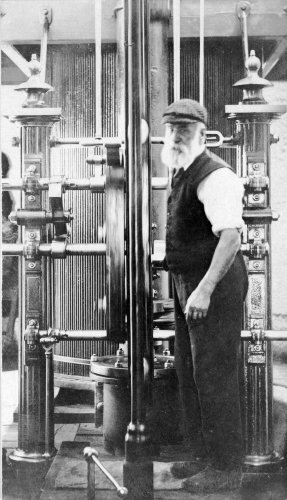 James Harrison (1838-1908) working at his Stationary Engine in Leawood Pump House about 1904.